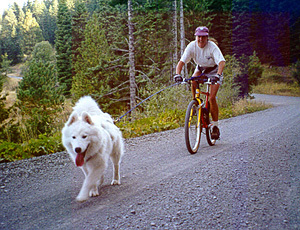 Our puppy Lightning loves to bikejor with Linda & Paul. 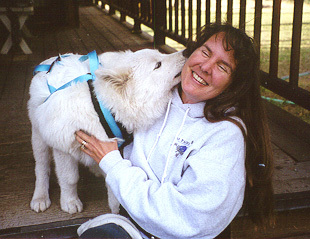 Lightning wears a harness which is specially designed for dogs that pull sleds. We wear a belt which was made for people who ski with their dogs while the dogs pull them (skijoring). Because Lightning's training for skijoring began in the summer, we decided to use our mountain bike on local dirt roads to teach him the commands. At five months old, Lightning discovered the joys of bikejoring. Here he is showing Linda what he thought of his introduction to the sport. Since his training began when he was so young, I pedal hard to be sure that our puppy isn't pulling too hard against the line. We strive to make activities fun and safe for our dogs.